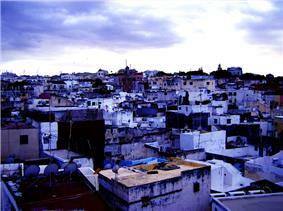 The Tangier American Legation is a building in the medina of Tangier, Morocco. The first American public property outside of the United States, it commemorates the historic cultural and diplomatic relations between the United States and the Kingdom of Morocco. It is now officially called the Tangier American Legation Institute for Moroccan Studies, and is a cultural center, museum, and a research library, concentrating on Arabic language studies. The legation was listed on the U.S. National Register of Historic Places on January 8, 1981. U.S. Secretary of the Interior James G. Watt subsequently designated it a National Historic Landmark on December 17, 1982. It was the first such listing or designation in a foreign country. The building has been listed on the U.S. Secretary of State's Register of Culturally Significant Property, a listing of State Department properties around the world that have particular cultural or historical significance. The legation is an elaborate Moorish-style building of stuccoed masonry. This complex structure contains the two-story mud and stone building presented to the United States in 1821 by Sultan Moulay Suliman. The first property acquired abroad by the United States government, it housed the United States Legation and Consulate for 140 years, the longest period any building abroad has been occupied as a United States diplomatic post. It is symbolic of the 1786 Moroccan–American Treaty of Friendship, which is still in force today. The complex expanded over the years as the surrounding houses were bought up. 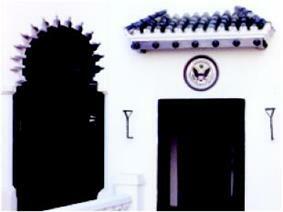 During World War II it served as headquarters for United States intelligence agents. After the move to Rabat as the diplomatic capital in 1956, when the country gained its independence, the Legation was abandoned as a diplomatic building. Over the years the United States government proceeded to use it as consul offices and Peace Corps offices, among other things. In time it became neglected and threatened with demolition. In 1976 a group of American citizens established a public, United States Government. 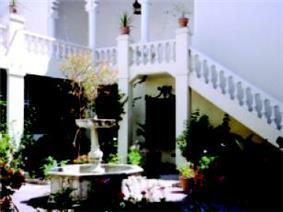 The Tangier American Institute for Moroccan Studies is a museum and cultural center for the study of Morocco and Moroccan-American relations, specializing in Arabic language studies, and it has many paintings by Marguerite McBey and other artists. TALIM's historic building now includes an entire wing devoted to the expatriate writer and composer Paul Bowles. The museum also has a research library and conference center. Gerald Loftus is the current museum director. 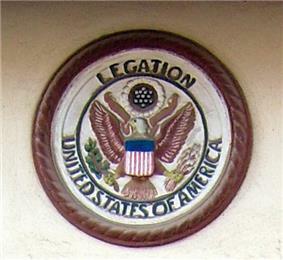 ^ "American Legation". National Historic Landmark summary listing. National Park Service. Archived from the original on 11 October 2007. Retrieved 2007-10-12.